The Sunyani Technical University (STU) has appealed for clearance by the National Council for Tertiary Education (NCTE) to enable it to run the Four-year Bachelor of Technology (B-Tech) programmes from the 2018/2019 academic year. The clearance would pave the way for the rest of the Technical Universities (TUs) in the country to also commence same as the process leading to the accreditation of those courses seemed to have stalled for almost two years now since the conversion of the Polytechnics to university status. 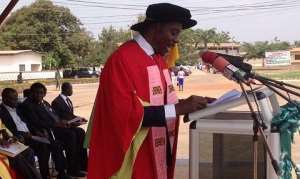 Professor Kwadwo Adinkrah-Appiah, the Vice-Chancellor (VC) of the STU made the appeal for the intervention of Prof. Kwesi Yankah, the Minister of State in-charge of tertiary education when he was speaking at the 10th congregation ceremony of the University on Saturday in Sunyani. He said the University was about to roll out the Four-year B-Tech programmes because the assessment of its readiness had long been completed by the National Accreditation Board (NAB) and the institution was still waiting for the NCTE to issue clearance to it for the NAB to accredit the programmes for running. On re-tooling of workshops and laboratories, Prof. Adinkra-Appiah expressed appreciation to the Minister of Education on his resolve to give urgent attention to Technical/Vocational Education and Training (TVET) and urged him to extend that to cover the TUs. This, he explained was because the TU education, through skills acquisition and entrepreneurial development was the bedrock of industrialisation that would drive the government's flagship programme of 'One District, One Factory' (1D1F). Prof. Adinkra-Appiah therefore appealed to the government to re-tool all the TUs to enhance their capacities to execute their mandates. He further pleaded with government to take steps to release funds for the supply of the STU's turn of the AMATROL Equipment Supply to retool the University's EEE/Mechanical Engineering laboratories and workshops, as had been done for the other TUs. Touching on projects, Prof. Adinkra-Appiah said the University had completed a number of them through its internally-generated fund (IGF) and they included the construction of Chemistry and Pharmaceutics laboratories for the Dispensing Technology (DT) Programme. A microbiology laboratory also for the DT Programme is currently under construction, whilst a water laboratory is also about to start for the Civil Engineering Department, he added. Prof. Adinkra-Appiah announced that the University's Science Park project which started 11 years ago was progressing steadily, saying that the basement floor of the building was expected to be completed soon for the installation of the AMATROL Equipment for the Mechanical and Electrical/Electronic Engineering Departments. The VC in that respect appealed to the Ghana Education Trust Fund (GETFund) to release funds for the payment of all outstanding certificates for the contractor to return to site to complete the project to enable the University to install the AMATROL Equipment and to solve other office accommodation challenges facing the institution's faculties/staff. Prof. Adinkra-Appiah advised the graduands to remember that the essence of the training they had received as TU graduates prepared them 'to be self-reliant, to be employers but not employees and job-creators instead of job-seekers'. He therefore urged them to apply all the entrepreneurial skills imparted to them seriously to start their own businesses and grow them into big enterprises. The VC said they could enter the field of self-employment by mustering courage to form partnerships with their friends and relatives, taking advantage of the government's several interventions for the Ghanaian youth, regarding new business initiatives like the 1D1F and the Planting for Food and Jobs. A total of 1,605 graduands who successfully completed their programmes of study for the 2016/2017 academic year were awarded certificates in various professional disciplines such as Building Technology, Civil Engineering, Hospitality and Tourism Management, Computerised Accounting and Procurement Management.